The new Curriculum for Excellence (CfE) is continuing to cause "anxiety" among teachers, according to research by academics at Stirling University. Their report suggested teachers broadly supported the principles of the flagship curriculum. But many were struggling to translate the new ideas into practice, it found. The Scottish government said "great strides" had been made since the information was collected in the past school year. Dr Mark Priestley and Sarah Minty, of the School of Education at Stirling University, carried out the research within a large local authority during 2011. It is the first extensive assessment of the new framework since its introduction in 2010. The CfE is generally viewed as a landmark development in Scottish education which calls for a shift in classroom practices towards more pupil centred approaches to education. But its introduction has been highly controversial, with progress in implementing the new curriculum varying in schools across the country. 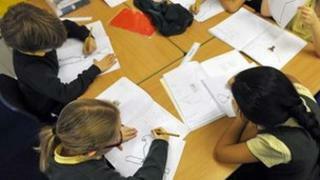 Primary schools have in general been making better progress than secondary schools. The researchers found that, while the majority of teachers welcomed in general the principles of CfE, there was, in many cases, confusion about how to turn the philosophy into practice. Related to this, teachers often found the guidance and terminology associated with CfE confusing and "vague". Many teachers said they were making progress in implementation, but this was accompanied by increases in workload, a lack of confidence and some anxiety about the directions taken within CfE. Schools that have taken a long-term, big picture approach to implementing CfE have made progress, the researchers found. But in some schools, implementation consisted of checking whether existing practice fits with the Experiences and Outcomes of CfE. In some cases this has led to strategic compliance with the new curriculum and fragmented, minimal changes to practice. Many teachers also reported tensions between the open ways of working advocated within CfE, and a continued emphasis on accountability driven by pressures to raise attainment. They suggested there had been insufficient time allocated in many schools for the sorts of high-quality teacher dialogue required to make sense of what are complex and often novel concepts around teaching and learning. Where opportunities for such dialogue have been made available, for example through the authority's specialist subject working groups, a greater clarity and sense of purpose has emerged about CfE, and implementation has been enhanced. Dr Priestley said: "The research aimed to identify effective practices of curriculum implementation and teachers' professional learning in the context of CfE. "It also produced insights to inform sustainable, large-scale curriculum change and support for teachers' professional learning. We anticipate that the findings will help to positively inform existing changes to the curriculum within Scotland." The research was conducted in tandem with a Scottish government funded partnership project, established between a Scottish local authority and the University of Stirling. A Scottish government spokeswoman said it had listened to teachers' views throughout implementation of the Curriculum for Excellence and had "responded supportively", most recently providing an additional £3.5m package relating specifically to the transition to the new qualifications, linked to wider CfE implementation. The spokeswoman added: "This research is based on information collected in the previous school year in a single council area and great strides have been made since then to ensure effective implementation and build the confidence of teachers. "The relevant council, we understand, has already learnt from the findings of the research and has reviewed its implementation programme, building on the strengths identified in the report, and addressed areas where further work is required."